NEW YORK, NEW YORK – April 12, 2018 - GameChange Solar today announced WeatherSmart™ technology. WeatherSmart™ is a revolutionary AI technology which allows dynamic interplay with the environment to optimize tracker power production using proprietary algorithms based on local weather patterns. The technology allows for meaningful increases in power production for the single axis GameChange Solar Genius Tracker™ of up to 1% in annual power production, typically 0.1% to 0.5%. Andrew Worden, CEO of GameChange Solar stated: “Project owners are striving for performance enhancements for their solar projects in the face of rising interest rates, high module prices with increasing steel and transportation costs. GameChange Solar has already demonstrated superior power output for its single axis Genius Tracker versus competitors due to higher panel density leading to wider row spacing and more time spent facing the sun. 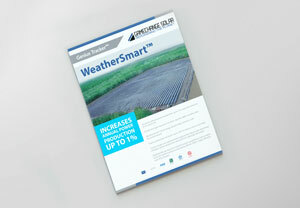 WeatherSmart technology moves GameChange even further ahead as the leading power production tracker and the clear best choice for project owners."